West Indies won by 7 wickets. But that's it for today. West Indies breeze past Sri Lanka, without the need for the Gayle to blow. England? They meet Afghanistan on Wednesday. Win that and they will be on the verge of the semi-finals. "What's to come?" I hear both of you cry. It's an Australian day tomorrow. The women meet New Zealand at 10:00 GMT, before the men take on Bangladesh at 14:00. Sri Lanka captain Angelo Mathews: "It was a tough day. I thought we were 20-30 runs short and we were horrible in the field. It might have been close if we held out catches. "The middle order let us down, losing wicket after wicket. We had to reassess as soon as it started turning." More from Darren Sammy: "I hope Chris Gayle is OK, but what today showed is that it's not a one-man show. It was ideal for him to not bat. We were shaky in the middle period, but Fletcher stepped up to show we have 15 potential match-winners." West Indies captain Darren Sammy: "We've always had close battles with Sri Lanka. It was good to see the way we bowled. The way Fletcher batted was brilliant. "He is an opener. He was picked in the original squad, but Johnson Charles got the nod. That's what you want, someone to have an impact." Gayle is now amongst the fans, posing for selfies. Good PR from the World Boss. The Windies, by the way, meet South Africa on Friday. Win that and they will be through. 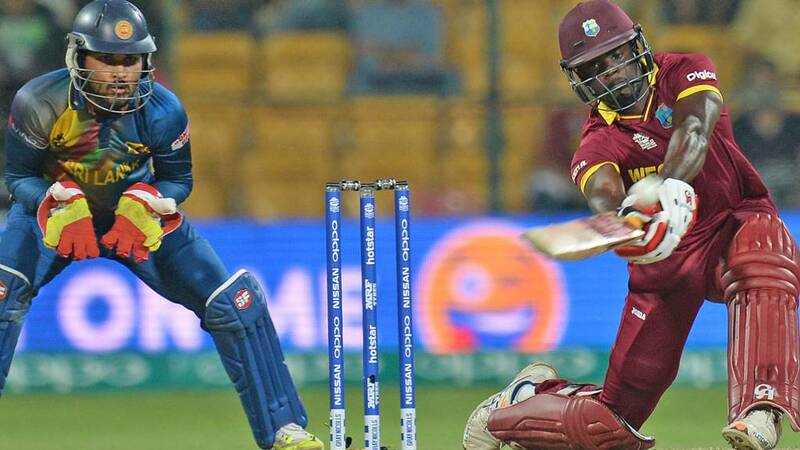 West Indies batsman Andre Fletcher: "It got harder to bat as the ball got older and I tried to bat through the innings. Chris Gayle is my mentor and he told me I would have a great day today and I'm happy he had confidence in me. I don't think I'll be taking his job though! "We have unity and are getting stronger but don't want to be complacent." Gayle emerges, waving to the crowd on what is his home ground in the IPL. He's got a huge smile on his face, maybe pleased that he's had the afternoon off. Hands shaken, the crowd very quiet, disappointed not to see the World/Universe Boss. West Indies lead the way in Group 1 with two wins from two. It looks like Sri Lanka will have to scrap it out with England and South Africa for the other spot in the last four. That will do! Andre Russell seals it with a six over cover. West Indies go two from two, even without the injured Chris Gayle. They'll take some stopping. Nearly there now. The Windies need seven from 12 balls. You are kidding. Nuwan Kulasekera has dropped an absolutely dolly off Andre Russell at third man. One of the easiest you will ever see. It's almost like the Sri Lankans don't want Chris Gayle in. The boos? They've reached 11. Ireland have lost their Women's World Twenty20 Group A match against Sri Lanka by 14 runs. Chasing 130 to win in Mohali, Isobel Joyce's side finished short on 115-8. Oh no. A mix-up on the straight boundary sees the two Sri Lankan fielders leave it to each other. Neither of them bother to bend down, so Fletcher picks up four. Windies need 13 from three overs.